On 20th of August, 2015, Mr. Sachin Khandelwal, an alumnus of the 1992 batch, was welcomed by the Alumni Committee on campus for a guest lecture to address the junior batch. Mr. Sachin Khandelwal has over two decades of experience in the finance and banking industries and is currently the CEO and MD of Magma Housing Finance and Chief Sales Officer at Magma Fincorp. Mr. Khandelwal started the lecture by stating the value of management education. Sir, then, opened the floor to questions and students came up with a variety of questions ranging from general questions related to the syllabus and specialisations to specific questions about the finance industry. Mr. Khandelwal answered all of the students’ questions with ease and poise. Mr. Khandelwal spoke about the causes of financial crises and the importance of sticking to the basics. Sir then emphasised on the value of inter-personal relationships. Sir also mentioned the changing world order and the importance of regulations. Sir spoke about the need to understand every discipline of management as every job requires an interplay of various management disciplines. Sir then underscored the need to know oneself well and encouraged each student to align current opportunities with their dreams. Sir urged students to innovate and watch out for competing products from related industries. Mr. Khandelwal explained to the students the need to work hard and look for projects that are related to their field of interest to gain experience. Sir stressed on the significance of following one’s passion with conviction. Sir emphasised on the importance of managing people and time, and maintaining a healthy work-life balance. The batch enjoyed the lecture and was encouraged by Mr. Khandelwal to introspect regularly and to follow their passion. 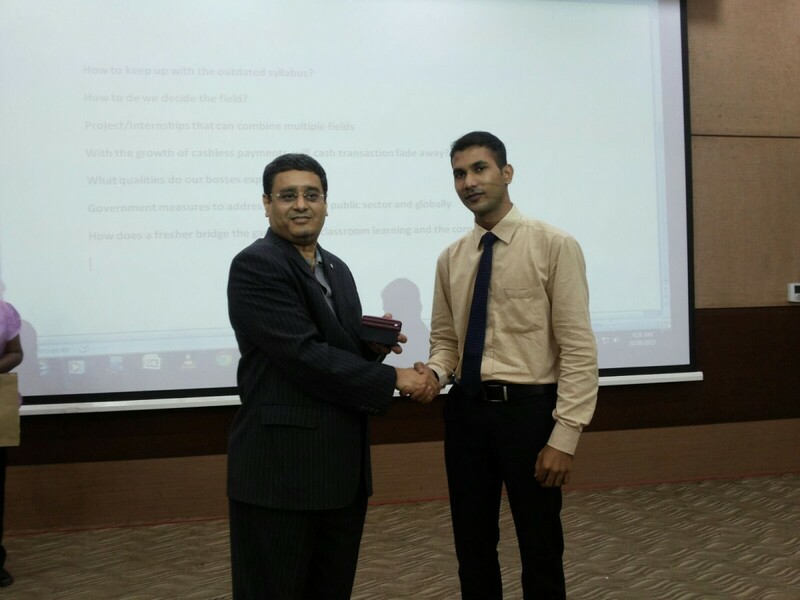 We thank Mr. Khandelwal for visiting the campus and sharing his valuable insights with the batch.